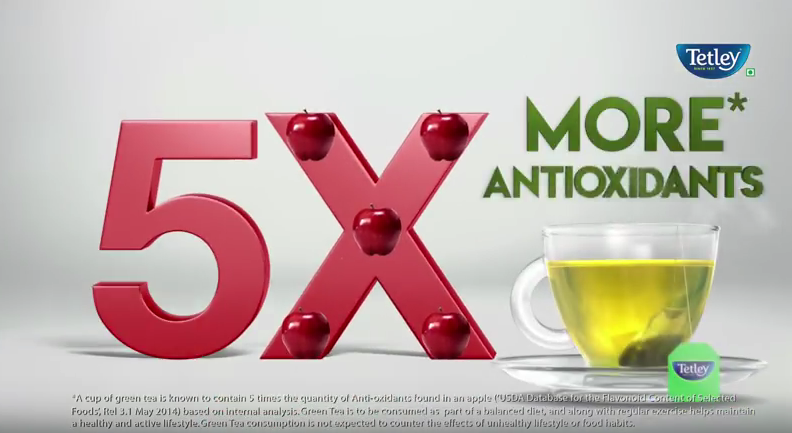 Tetley claims that their green tea contains 5X more antioxidants than an apple. Check out their ad if you haven’t seen it yet. The ad seems to convey this message - “eat whatever junk you want. If you drink green tea, all your sins will be washed away! Your internal system will be cleaned”. So the underlying promise is that green tea does jaadu pocha (sweeping and mopping) inside your body. BTW, in the ad, in very fine print, there is a line - "Green tea consumption is not expected to counter the effects of unhealthy lifestyle or food habits". Wait a minute, but isn't the whole point of the ad all about Deepika eating unhealthy foods and cleansing it with green tea? Earlier, Lipton claimed that green tea helps to reduce belly fat. I had also written about it in detail in a separate blogpost. I know many people who believe that drinking 3-4 cups of green tea will melt their fat away. And some of them even add a little sugar-free (artificial sweetener) to make the bitter tasting green tea bearable. How these ads cleverly convey that green tea is the miracle drink for all health issues! And it is so appalling that educated people fall for such messages. Oxidation is a normal process that occurs in our body on the molecular level. It happens when the cells process the oxygen we breathe and generate energy. Oxidation also occurs when the cells use glucose to make energy, when the immune system is fighting off bacteria, when the body is detoxifying harmful chemicals like pollutants, cigarette smoke etc. Oxidation also occurs when we are physically or emotionally stressed. Oxidative stress play a major role in today’s many illnesses such as heart disease, cancer, Alzheimer’s, Parkinson’s etc. During the process of oxidation,certain highly reactive and unstable particles known as free radicals are produced, which interacts with other molecules in our cells, causing cellular damage. There are thousands of antioxidants found in fruits, vegetables, whole grains and various other ingredients, that help protect our body from oxidative stress. These antioxidants either suppress formation of free radicals OR prevent them from causing any damage OR repair the damage already done. Now let’s come back to green tea. - Brewing time - brews of 5–10 minutes at temperatures 80–100°C will result in infusions with greater antioxidant capacity than teas created using a shorter brewing time and lower temperatures. (2) The measure of antioxidants present in a food is quantified using a lab test, where a sample of the food is placed in a test tube, along with certain molecules that generate free radical activity and certain other molecules that are vulnerable to oxidation. After a while, they measure how well the sample protected the vulnerable molecules from oxidation by the free radicals. This measure is called ORAC or Oxygen Radical Absorbance Capacity. (1) As you can see, ORAC value of green tea is so low (1253 mu mol TE/100 gms), compared to various other Indian spices. Please note, this value depends on the green tea sample that was used by USDA. Tetley Green tea’s ORAC value may or may not be the same. I have asked Tetley to share their values from the lab tests but I haven’t heard back from them yet. Even if the value is double or triple than that of the USDA sample, it is still nowhere close to the values of other spices. (2) Triphala powder and especially amla have always been associated with anti-ageing and increased immunity in traditional Indian medicines such as Ayurveda and Siddha. Sadly, these don’t get enough media attention. 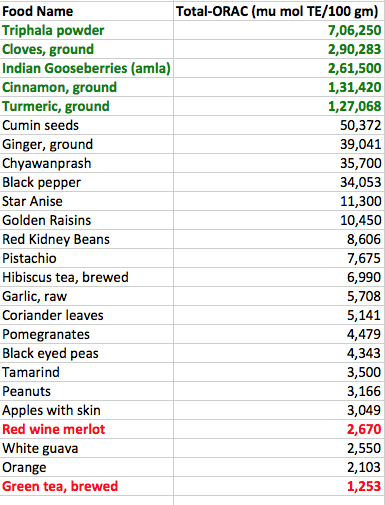 (3) Red wine isn’t that high on antioxidants as many believe it to be. There are much better and healthier foods with higher antioxidants. A simple concoction brewed with spices will give you enough antioxidants. You don’t need the hyped-up green tea. And most importantly, green tea will neither melt your fat away nor it would clean up all the junk from your digestive system. From where u hav taken these values? They are totally different from the ref no. 1 u hav mentioned. Plz send the authentic source of this table. Updated the correct source, thanks for pointing out. Consuming green tea is bad eh?? @Amulu, Not saying it is bad. But it is definitely not a miracle drink that will melt away belly fat or help you lose weight. Wow, simple and crisp answer. Thanks!